Easter is a time where chocolate and dried fruit aren’t usually in short supply! Both of which can be highly toxic to our pets. If your pet does manage to get hold of some chocolate it can endanger their health, sometimes seriously. 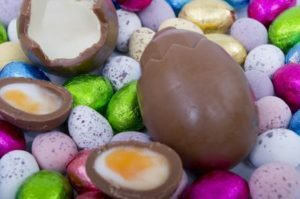 The reason chocolate is poisonous is because it contains a chemical called theobromine and while we usually focus on dogs due to their appetites and their amazing ability to steal food, please note that this chemical is not only poisonous to dogs, but is also poisonous to other animals such as cats, rodents and rabbits. Although any chocolate should be kept out of reach of your pets, it’s important to note that the darker and more expensive chocolate usually contains more theobromine, which can make this more poisonous. Although white chocolate contains less theobromine and is less likely to cause chocolate poisoning, it’s still very fatty and can still make your pet ill. If your pet does eat some chocolate, depending on their size and the amount they’ve consumed, initial symptoms can be vomiting and diarrhoea. Chocolate is also a stimulant and can lead to your pet becoming excitable, as well as developing muscle twitching, tremors, fitting and life threatening problems with their heart and severe cases can be fatal. 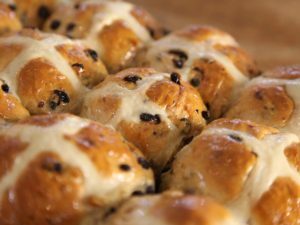 All grapes, raisins, currants and sultanas, as well as foods that contain them such as hot cross buns and simnel cake, can be poisonous to dogs, and potentially poisonous to cats. It’s thought the dried versions of the fruits are more likely to cause severe symptoms and potentially renal failure. But it’s unclear exactly what causes the toxic effects. After removing the source of the dried fruit, call your vet. It’s likely that your vet will ask you to bring your dog into the clinic. If this is the case take a sample of whatever they’ve eaten or, if possible, the wrapper or box the food containing the fruits came in. Do not try to give your dog salt water or induce vomiting. Normally symptoms start showing between 6 and 12 hours after your dog has eaten grapes or raisins, with liver failure developing within 24 to 72 hours of exposure. But these may not take effect for several days. In the most serious cases, the fruits can also cause sudden kidney failure. If you suspect your pet has eaten something that could be toxic please contact your vet straight away. Please click here for the details our Oakhill Veterinary Centre locations, contact details and opening hours.